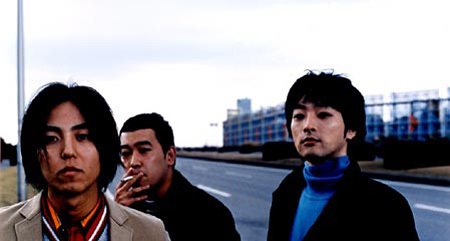 hatsukoinoarashi started as a college band in 1997. In December 2000, they released their first EP “Ballad Collection”. The EP gained popularity gradually among Western CD chains in Japan. After the recording, the first bassist left the band but the existing member, Sumikura joined right away. In August 2001, they released their first single “Untitled”. The quality of the song brought attention to the band among the media and industry people, and the song was power-pushed on radio stations. In February, they went on to tour nationwide sharing stages with Scoobie Do. On March 27th they placed a song titled “Namida no Tabiji new version” in a compilation album “Smells Like Teenage Symphony” released by Dreamusic, which ranked high in college radio stations and was power pushed at Nippon Hoso radio. On July 10th , they released their major debut single “Manatsu no Yo no Yume, c/w Namida no Tabiji (original version)”, followed by the first album “Hatsu Koi ni Sasagu” released on August 21st. They relaunched their performing career on September 22st , 9 years after the pause. They performed at festivals and events such as RADIO CRAZY, RISING SUN ROCK FESTIVAL, and ARABAKI ROCK FEST. On June 27st, they released “Hatsukoi ni Sasagu Plus”(2-CDs) . On November 10th , they re-recorded songs from the old mix tapes, releasing the second album “Second.